The diagram shown above is a simplified Palm Reading Hand Chart of the kind used by people who are highly experienced in palmistry. As you will notice, the main lines that appear on the palms of most people's hands are three lines running semi vertically, and three lines running somewhat horizontally. LINE 1: This is the top-most horizontal line, known among palm reading experts as the "Heart Line." The Heart Line is said to reveal the nature and intensity of a person's emotional inclinations, especially regarding romantic situations. LINE 2: This is the middle horizontal line, commonly known as the "Head Line." According to professionals in the field of palmistry, the Head Line reveals info about a person's intellectual abilities. The Head Line is believed to provide insight pertaining to levels of concentration and creative imagination. LINE 3: This is the lower horizontal line, which usually curves downward. This line is known as the "Life Line." A sign of physical energy, the Life Line is said to indicate a person's overall state of physical health, as well as his/her approximate life expectancy. By the way, Do not take Palmistry TOO seriously. 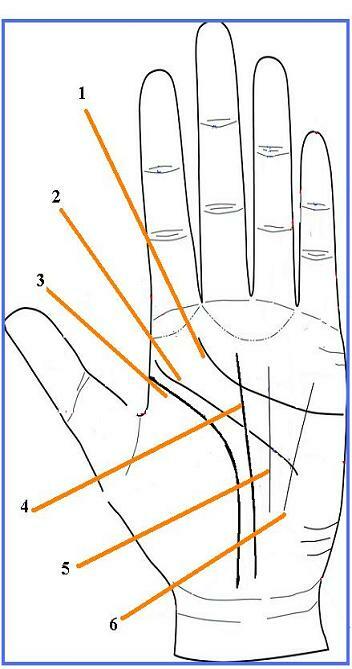 LINE 4: This is the longest vertical line on the palm reading hand chart, located on the far left. Line 4 is known as the "Fate Line," and is believed by some to reveal information regarding a person's career and financial status. If a career change is in the cards, the palm reader will see it in your Fate Line. LINE 5: This is the middle of the three main vertical lines. This line is called the "Success Line." It is an indication of the quality of a person's accomplishments, as opposed to material wealth. In some people, the Success Line may reveal surprising hidden talents worthy of further exploration. LINE 6: This is the right-most vertical line, also known as the "Health Line." The Health Line is said to address specific health issues such as infertility or nutritional deficiency. According to various palmistry experts, this line can also identify the strongest and weakest areas of a person's body and determine pregnancy in some cases. To print the Palm Reading Hand Chart shown above, just right click on it and select a SAVE option from your drop-down menu. This will send it to your picture file. From there you can reduce it or enlarge it as needed before printing out as many copies as you like for your own personal use. For more charts, tables, and other useful visual references, visit any link on this page.